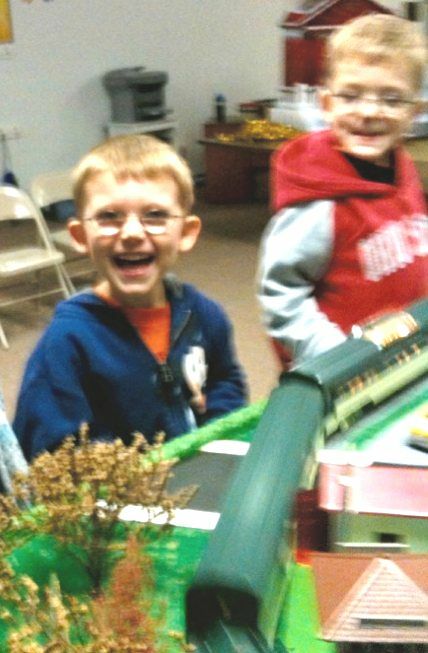 If you are doing what you are supposed to be doing in life your face should look like this…..
That is the joy T.Puzzle demonstrated at the Christmas-themed model train display. I mean for goodness sakes there was even a Thomas the Tank Engine train!!! Fun was had by all as the boys scurried from one station to the next. They could press buttons and make different sections light up and move. That is until Full Speed thought it was his little brother trying to climb up on his chair (it wasn’t, it was a poor, unsuspecting boy we did not know). Full Speed shouts and brings his arm back and attempts to karate-chop off the boy’s head. It was time to cut our losses and leave. Of course this turned little T.Puzzle’s joy into sadness. However, all’s well that ends well with pizza. this is absolutely hilarious-Frack shouts and brings his arm back and attempts to karate-chop off the boy’s head. Oh how we can mistake people and it is just so funny. Yes, Frack can let loose some aggression when you least expect it. The good news is that these displays are less frequent for the public at large, the bad news is that his little brother needs to sleep with one eye open.